As 2014 draws to a close the 16th issue of the CAPjournal finds itself on your shelf — or screen — just in time for some Christmas reading. This year has been an exciting one for the astronomy community. ESA’s Rosetta flooded our Twitter feeds and grabbed the attention of the media, as future missions like the James Webb Space Telescope and the European Extremely Large Telescope gathered momentum. Far from succumbing to complacency in the face of such self-selling projects the communicators of astronomy are showing their knack for innovation, as exemplified by ESA’s film Ambition. Whilst editing this issue of the journal I had the pleasure of being a guest at the Space Telescope Science Institute in Baltimore, USA and the fortune to work shoulder to shoulder with their outreach team. They are one of the many teams striving for ever more creative initiatives to bring astronomy to wider and more diverse audiences. The experience left me buzzing with excitement for what the next few years has in store, and, from a personal perspective given my role as ESA/Hubble press officer, for Hubble’s 25th anniversary celebrations next year. But the community of astronomy communicators goes far beyond those of us in observatory and space agency press offices. The strength of the CAPjournal is its role as a common forum for everyone working in the field. From those writing the press releases, to those bringing tools for outreach to underprivileged communities. From the “sit-and-writers”, to the “go-and-presenters”, and everything in between. 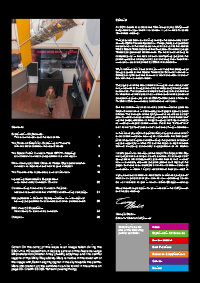 In this issue you will find articles discussing the value of science communication training for scientists, the best practices when looking for crowdfunding, the process of capturing the night sky in Ultra HD and the logic, or lack thereof, behind stripping astronomy engagement of its maths. I make particular mention of the book The Edge of the Sky, the subject of one of this issue’s articles. As science communicators we occasionally assume that to find innovation in outreach requires projects above and beyond the page, but here is an example of written communication as innovation in itself. I highly recommend that you read it. If you have any comments, feedback, or wish to send a submission or proposal of your own for our upcoming issues, do not hesitate to get in touch: editor@capjournal.org.